Dhaka, 11 May, Abnews: Rishabh Pant’s explosive 128 not out off 63 balls couldn’t prevent Sunrisers Hyderabad from beating Delhi Daredevils by nine wickets to knock them out of contention in the Indian Premier League on Thursday. 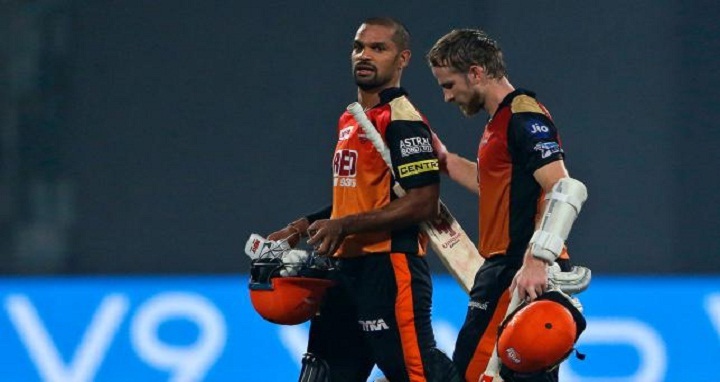 Shikhar Dhawan scored 92 not out off 50 balls for Sunrisers while Kane Williamson made 83 not out off 53 balls. They put on 176 runs for the unbeaten second wicket to dash Delhi’s hopes and secure a spot in the knockout round for Hyderabad. The visitors finished at 191-1 with seven balls to spare in reply to Delhi’s 187-5, which included 15 fours and seven sixes from Pant. Hyderabad didn’t make the best start with Alex Hales (14) adding only 15 with Dhawan. But he and Williamson weren’t parted until the end thereafter. Their 50 partnership came off 34 balls, and expanded to a century-stand off 62 balls. In doing so, Dhawan scored his second half-century of the season off 30 balls. For Williamson, this was his sixth half-century, coming off 38 balls. Their partnership crossed 150 off 88 balls and they never really looked in any bother as Delhi ran bereft of ideas. “Pant played a special knock and the target was above par. The dew played a little part. (But) we have been playing on tough batting surfaces so it was nice to go out and execute our batting plans,” said skipper Williamson, after Hyderabad recorded their sixth consecutive win. Earlier, Pant rescued the Daredevils from a precarious 21-2 to script a fine turnaround. Opting to bat first, Shakib Al Hasan (2-27) accounted for both Delhi openers Jason Roy (11) and Prithwi Shaw (9) off successive balls in the fourth over. Pant was then involved in a horrible mix-up that resulted in skipper Shreyas Iyer (3) getting run-out going for a non-existent single. The keeper-batsman then took charge of proceedings as he put on 55 runs off 38 balls for the fourth wicket with Harshal Patel (24). Pant reached his half-century off 36 balls and then accelerated further, scoring 79 runs off the last 28 balls he faced at an astounding strike-rate of 282.14. While Patel was run out and Glenn Maxwell (9) fell cheaply again, Pant reached his maiden IPL hundred off 56 balls. At 20 years and 218 days, he became the second youngest Indian batsman after Manish Pandey (in 2009) to score an IPL century. Pant wasn’t done just yet, as he took 26 runs off Bhuvneshwar Kumar’s (1-51) last over to finish with the highest individual score for an Indian batsman in IPL history, eclipsing Murali Vijay’s 127 (for Chennai Super Kings) in 2010. It was also the highest individual score by a batsman in the current tournament, albeit his knock wasn’t enough to keep the Daredevils afloat for longer.